Cleaning surfaces soiled with oil or grease is a really tough job and can be performed efficiently by the use of hot water pressure washers with the application of hot water for accomplishing such jobs. Hot washer pressure washers can serve you better than regular cold water types when you have to deal with such cleaning jobs. Hot water pressures washers can be engaged for any size job as they are easier and faster to use, but since they are more expensive they are mainly used for large scale uses and industrial or commercial purposes than for residential use. They are mainly used to clean floor of vehicle garages which will be stained with spilt oil and grease, tractors, vehicles, boats, trucks, mining equipment’s like excavators, crushers, transfer chutes etc and exterior parts of large buildings. Generally, hot water units perform better compared to cold water ones where huge amounts of oil or grease are to be removed or if some temperature reactive material is to be dealt with. In hot water pressure washing, heat is the most vital element regarding cleaning. Heat and high water pressure together will create an abrasive effect, which in combination with detergents or chemicals will emulsify the dirt, grease or grime and hard stains and at last the water pressure will loosens them and the flowing water will wash them away. Hot water pressure washers are equipped with on board water heaters which will heat water to a temperature of 200 degrees. Usually these water heaters are diesel or kerosene powered, and need an electric starter to start working. The water heater is a storage tank with a cylindrical design provided with a heating coil passing through the inner side. To start the heating process a burner is fitted at the bottom of the heater which emits a flame to heat the water passing through the water tubes. There are provisions for cold water entry and hot water exit. Water enters the pressure washer from a storage tank through a hose. This water will be passed through a high pressure pump, for speeding up the water flow through the heating oil, having length about 200 feet, half-inch size, schedule 80, pipe made of steel. The winding of the heating oil is helical or circular in configuration which will expose the water to the flame to the maximum level as it pass through the center portion of the coil. Regarding the electric powered hot water pressure washers, the heating coil will be immersed in a hot water tank. After completion of this heating process, the water will attain a temperature of about 200°F and will be delivered out of the heating coil and will pass through the spray wand and the nozzle with an amazing cleaning power. You can see that some pressure washers come with an option for steam by superheating up the water to about 280°F. These are meant for rare applications where the requirements demands higher temperature for cleaning. It is proven by experience that application of hot water along with high pressure is the most efficient method of cleaning compared to steam. The reason for this is that the hot water cleaning employs the principle of agitation i.e., water with high pressure pounding on the surface to be cleaned. You can more about hot water pressure washes here. Steel Frame Cart with wheels: Since hot water pressure washers are very heavy compared to cold water types, they need extra support of the wheels. Depending on the size of the machine, they are provided with two or four big wheels and strongly built cart frames. Gas or Electric Powered Engine: Similar to the cold water pressure washers the electrically powered pressure washers have less power, less and cheaper. They are less portable because they need to be plugged-in to the power source while functioning. Cleaning power in terms of PSI, GPM and HP: The most important factors to be considered while selecting a pressure washer are the pressure and water flow which determine the capacity of the pressure washer to carry out a task. PSI stands for pounds per square inch which denotes amount of pressure applied on the material or surface to be cleaned. In general pressure washers deliver water under a pressure range between 1000 and 5000 PSI. GPM or Gallons per minute is the unit for water flow which explains the quantity of water used per minute by the machine. This will determine the speed at which the dirt can be washed off from the surface when the dirt get loosened from the surface. It may be kept in mind that a pressure washer having higher GPM value like Shark SGP 353037 will need less time to finish the job. Horse power or HP is the unit representing the work efficiency which is another equally important factor to be considered while buying a pressure washer. This will give you an idea about the amount of power the machine will need to execute the job. In general, machine with more horsepower will let higher GPM or PSI or both. Larger engines are considered more powerful and efficient and capable of carrying out the cleaning jobs faster. Large engines with high horse power are long lasting compared to the small ones. Since hot water pressure washers possess the additional features like water heaters and heating coils, they require more care and maintenance. Parts such as the burner assembly, heating coil, pressure protection fittings, etc. need annual service and maintenance. Hot water pressure washers provide an ultimate solution for eliminating oil, grease, dirt, and grime, and are extremely useful for large scale cleaning projects, business and industrial applications. These power packed machines like Simpson Mini-Brute MB1223 will let you maintain your work space, vehicles and equipments cleaner and safer. Choose a durable high quality and easily manageable hot water pressure washer to accomplish great perfection in such jobs. Ventures which need removal of hideous grease and grime consider this pressure washers a must have. Restaurants, Bakery’s, construction companies, power Washing contractors meat & dairy Factories, and most other commercial and industrial firms that require quick and easy clean-up solution are the major users of hot water pressures washers. There are different types of hot water pressure washers available today which can be categorized based on the power source like electric, gasoline, diesel, natural gas, or liquid propane etc. You will find hot water pressure washers designed specifically for farms, construction, factory plants, heavy-duty jobs etc. Generally the hot water pressure washers range from 1000 to 5000 PSI regarding the pressure and 2 to 10.8 GPM in water expulsion. You can also choose from portable, skid, cart -mounted, master- frame designs according to your needs. Electric pressure washers are also available in the range of 120, 208, 230 and 460 volts. Hot water pressure washers will help to reduce the cleaning and drying time. These are the best available equipments which you can rely upon for more rigorous and perfect kind of cleaning. You will need fewer amounts of water and detergent compared to cold water types. These pressure washers are highly suitable for carrying out cleaning your home exteriors and heavy duty jobs. With the powerful cleaning capacity of these equipments you can achieve great perfection in cleaning jobs. The water heater which is an additional component will add to the cost of repairs and you have to be extra careful while handling this power cleaner because of high pressure and temperature. Some users doubt that pressure washers require a lot of water for operation, but that concept is wrong. You can see that a garden hose on an average uses seven to nine gallons of water in a minute, where as an average pressure washer unit require only three to five gallons per minute. Hence it can definitely stated that pressure washers are convenient for use, faster, and better in performance which can save water also. Though they are expensive than cold water type, they will save the labor cost by offering a quicker and more effective performance. As the water is pushed through the washer at a very powerful rate and less detergent is used for cleaning this will also help you even save your money. If you looking for a pressure washer to clean your car, engines, or something stained with grease or oil, a hot washer is the best option. Similar to cleaning your dishes in your kitchen sink, hot water can expel oil and grease whereas cold water can only displace it around. In terms of the pressure applied, volume of water required, horsepower relationship etc., both cold and hot water pressure washers may sound equal but when it comes to dealing with oil and greasy surfaces hot water pressure washers offer the best possible option. While searching for a high pressure washer keep this point in mind and choose the best hot water pressure washer for your needs. Shark SGP 353037 3000 PSI 3.5 GPM Honda gas powered hot water commercial series pressure washer is the best available heavy-duty hot water pressure washer which applies the technique of hot water cleaning. 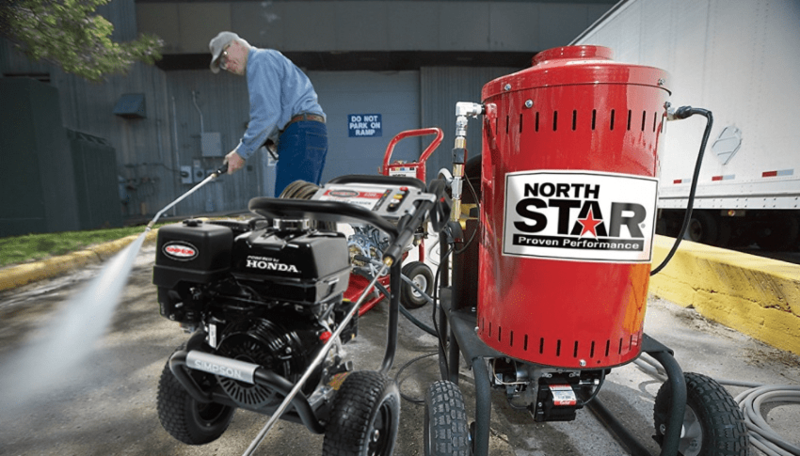 This is a versatile and portable gas pressure washer best suited for harsh conditions. It comes with strong steel chassis to withstand difficult conditions and is constructed from durable and strong components. This machine is compact in design and comes with pneumatic wheels to let you maneuver it in different places. 1) This pressure washer is easily manageable and possesses a highly powerful, efficient and durable Honda GX engine which makes the machine strong and efficient. 2) These pressure washers are extremely useful for large scale cleaning projects, business and industrial applications. 3) This pressure washer is fast, efficient and reliable and is silent in operation compared to other gas powered pressure washers. 4) This product is easily portable due to its stable stature and a compact design and is best suited for tough jobs. 1) Since this pressure washer has additional features like water heaters and heating coil more careful maintenance and frequent servicing are needed. 2) You have to be very careful to avoid using these machines in confined places as they are gas powered and will emit dangerous gas carbon monoxide gas. This gas powered pressure Washer is a reliable pressure washer which is handy and portable which can perform cleaning jobs with great precision and reliability. It is capable of a pressure delivery of 3000 PSI at 3.5 GPM with the robust triplex pump powered by an efficient and powerful 337 CC Honda engine provided with a recoil starter. You can also look at our Simpson Pressure Washer Mini-Brute MB1223 reviews. This pressure washer can be employed for tough cleaning jobs you may face at your work sites and you can expect a commercial level performance and reliability from this gas powered pressure washer. If you are in need to buy a commercial grade pressure washer for your cleaning needs, you can go through our commercial pressure washer buying guide. This gas powered hot water pressure washer weighs 558 pounds and it comes with a tough steel chassis and a robust frame including lifting points. Its 13″ pneumatic & vibration absorbing tyres make it easily portable and suitable for different terrains. This pressure washer come with 5 different types of spray tips which can be mounted safely on the frame so that they will not get misplaced. Easy to follow, multi-language instructions regarding operating the machine are printed on the control panel. To ensure safe and convenient use of this machine, an hour meter, an automatic thermostat, and a burner on-off switch are also provided with it. This pressure washer owns a 6 Gallon Polyethylene fuel Tank, tucked away in the roll cage design to contain diesel required to fuel the burner. It lets you work continuous for hours without frequent fuelling. The Insulated Professional grade dual type steel wand allows the siphon action of detergents, especially meant for pressure washers. This pressure washer owns a fuel efficient combustion compartment which is diesel fueled. It is provided with a leak free, durable schedule 80 steel heating coil which is contained by standard stainless steel wrap and a 12V DC Burner. It employs an easily accessible, highly efficient 326,000 BTU Beckett burner, which can heat up the water to about140 degrees. This pressure washer consists of a heavy- duty frame finished with Black wrinkle paint, meant for all-weather protection. There are various types of pressure washers available in the market and you need to do some home work for buying the best product available matching your needs. Shark SGP series 3,000 PSI 3.5 GPM gas powered pressure washer is the best available hot water pressure washer in the gas powered, heavy-duty category. It is equipped with a direct drive pump, engine vibration isolators and a polyethylene fuel tank with a 6 gallon capacity. These features will help you to work continuously for hours without much effort. This machine is very silent in operation also. A highly efficient, gasoline powered 337 CC Honda engine with a recoil starter makes this machine efficient, durable and powerful. This machine has 7 years warranty for the pump, 1 year for its parts, 3 year for the coil. This pressure washer is highly suitable for outdoor requirements, industrial workplaces, restaurants, commercial parking areas and other areas which require cleaning with hot water and will give you the reliability of premium commercial level pressure washer. This pressure washer is convenient to use, faster, and better in performance. Though they are costlier than cold water and electric types, they will save the labor cost by offering a quicker and more effective performance. They are flexible and long-lasting too. The few drawbacks of these machines include their large size and their need for frequent servicing and maintenance. These pressure washers are very easy to handle right from starting to maintenance. They are extremely useful if your requirement demands more powerful cleaning within a short period of time and will also help you to save water. So what are you waiting for. Go for Shark SGP 353037 pressure washer today. HOST Dry Carpet Cleaner is all natural and contains a balanced blend of moisture, detergent and a small amount of safe-to-use solvents. HOST dissolves, absorbs and traps greasy, oily dirt, spots and odors it is brushed through the carpet. Unlike wet-cleaning methods, HOST does not leave any sticky, soapy residue behind to attract dirt and cause resoiling — and spots won’t wick back. HOST is a safe for people and pets and can be used on all types of carpet including stain-resistent, will, sisal and orientals. Treat Spots & Spills Immediately: The trick to preventing spots and spills from turning into permanent stains is to treat them immediately. Unlike some other cleaners, HOST can even be used on wet spills. Clean Traffic Areas Routinely: Routine cleaning of high traffic areas such as entranceways, hallways and in front of favorite furniture will also help improve the appearance of your carpet. Deep clean wall to wall every 6-8 months (more often if you have pets or small children): Contact your HOST Professional Cleaner for a wall-to-wall clean. The Dry-Clean Machine’s unique counter-rotating brushes lift matted carpet pile and insure that HOST Dry Carpet Cleaner gets deep down into your carpet to remove soil, spots, allergens, and odors. Carpet is left clean, dry and ready for immediate use. How to Avoid Permanent Stains? Test for color fastness: Take a small amount of HOST Dry Carpet Cleaner and brush it through the carpet with your fingertips in an inconspicuous area. If color transfers or changes, do not use. Test for texture distortion: Test the HOST Carpet Brush in an inconspicuous area of that carpet or rug. If any texture distortion occurs, do not sue. Not that aggressive brushing may also cause texture distortion. Natural Fibers (sisal, coir, jute, seagrass, etc. ): Natural fibers are very absorbent so permanent discoloration from spots, spills and liquids may occur. Note that the color of these fibers may be affected by any type of cleaning.CAUTION: HOST Spot Remover or other liquids (unless specified) are not recommended for use on natural fibers. Delicate Rugs (Oriental, Chinese, Persian, etc. ): These rugs are often made with wool or silk fibers. When brushing, be aware of the texture, do not brush aggressively. Wool or Wool Berber HOST Dry Carpet Cleaner and HOST Spot Remover carry the WoolSafe seal of approval. When cleaning wool it is normal to experience some shedding, but avoid aggressive brushing as it can cause wool to fuzz. Cleaning wool Berber can be a challenge because it is even more susceptible to fuzzing and texture distortion. To avoid, brush only in the direction of the rows of loops, not across the loops. Or call a HOST Professional Cleaner near you. Synthetic Berber (olefin or nylon): These fibers may require additional brushing, but if any texture distortion occurs, stop! 1. Shake HOST Dry Carpet Cleaner onto spot, spill or dirty traffic area until covered. If traces of the spot remain, follow procedures in E. Stubborn Spots. Blot up any excess moisture by pressing firmly with clean, white paper or cloth towels, working from the outside of the spill inward to avoid spreading. Continue blotting until no more moisture transfers to the towel. Wait until the area is completely dry. For wet spills, this may take overnight. HOST Dry Carpet Cleaner will lighten to a pale gold color as it dries. Then follow procedures in A. Basic Spot Cleaning Technique for Dry Spots. Then follow procedures in B. Basic Spot Cleaning Techniques For Wet Spills. If traces of a spot or spill remain after following the Basic Spot Cleaning Technique, use HOST Spot Remover. * Do not pour HOST Spot Remover directly onto the carpet. First, test for color fastness. App;y a small amount o HOST Spot Remover to a clean, white towel and blot on the carpet in an inconspicuous area. If no color transfers, proceed. Then repeat A. Basic Spot Cleaning Technique for Dry Spots. * HOST Spot Remover or other liquids (unless specified) are not recommended for use on natural fiber carpet and rugs. If traces of spot remain, repeat applications of HOST Spot Remover.